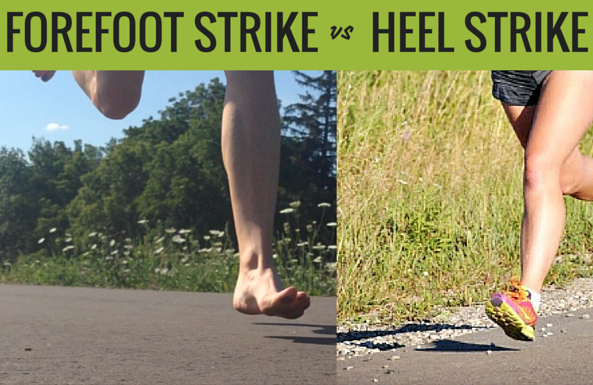 The debate of heel strike vs forefoot strike is ongoing in terms of which one is better than the other. To understand why forefoot running is better than heel strike running, we need to understand how they differ in their mechanics, and thus impact generations. 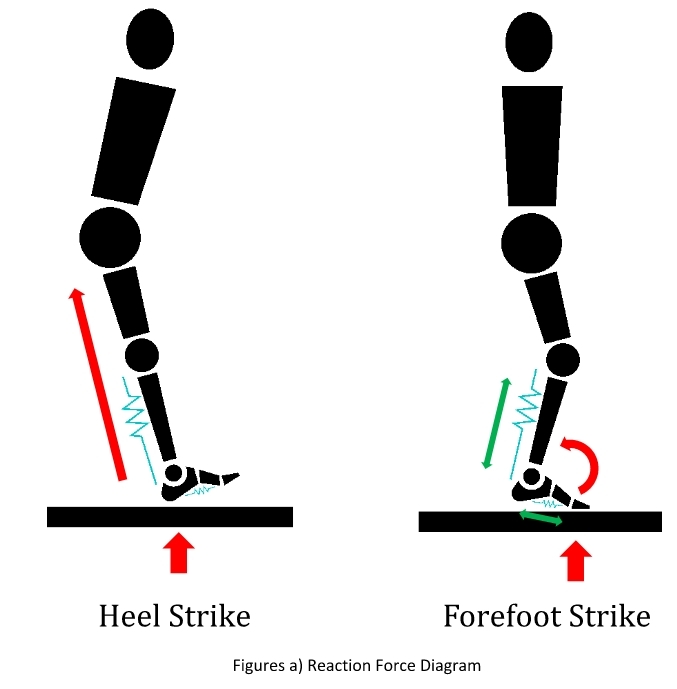 So, it’s time for an engineer’s logical assessment of the forefoot strike and heel strike. When the basic structure of the foot and leg are simply diagrammed, the mechanics become very revealing. So let’s look at the basic reaction forces on the foot during heel strike running compared to forefoot running. Figure a) below shows the heel strike runner, followed by the forefoot strike runner. Both of these diagrams depict the runner at the first point of contact during the running stride. The circles represent the major load bearing joints; the ankle, knee, and hip. The foot is composed of many bones and joints, but I have simplified them for this demonstration. Also note, I have represented the calf muscles as a diagrammed spring, and I have done the same for the tendons on the bottom of the foot. First, let’s look at the heel strike runner. Note, I have depicted the worst case heel strike form, and many runners have varied running forms that could range from the worst case to more of a midfoot strike pattern –some runners may think they are heel strike runners, when actually they are running comfortably with a modified midfoot strike. As for the worst case heel strike runner, he has his leg extended forward and straight at the moment of first contact with the ground. This is the moment of highest loading on the joints, which has been reported as much as 12XBW. With the body in motion and landing in a stiff-legged fashion, the heel is taking the full brunt of this force, which travels directly through the ankle, the knee, the hip, lower spine and internal organs. With the heel hitting first, the strong springy tendons underneath the foot are flopping in the breeze, doing nothing. Also note that all the muscles of the leg are mostly relaxed, allowing the straightness of the leg to take all the shock through the bones. The only cushioning is provided by cartilage between the bones. The muscles, tendons, and ligaments do very little to cushion the impacts. Due to the location of the heel in relation to the ankle, the calf muscle is actually being squeezed together, which does nothing for taking any shock. Although the diagram is representing the calf as a spring, muscles are designed to take load in tension only. So a muscle is really like a stretchy rope. Therefore, when a muscle is compressed, it is in a relaxed state doing nothing. The analogy is that you cannot get any work by pushing on a rope. Again looking at the heel strike diagram, note the leg is forward with the point of impact in front of the pelvis, and with the disadvantage of the force being directed backwards. In order to keep forward motion, the upper body must compensate by leaning forward, and thus the lower back is constantly working to keep the body in this position. This could lead to a sore back by overworking these muscles, and with the added disadvantage of the direct shock created by the straight leg heel strike, those forces easily propagating up the leg and to the spine. The red arrow represents the 12XBW force that translates up the leg. Because there is little cushioning effect by the bones, this full force is translated to the pelvis, spine and internal organs. This type of force could lead to many foot ailments, increased degradation of the joints, and may be why knee and hip arthritis, and lower back pain are so prevalent. I also mentioned the internal organs receive impact loading as well, and this may lead to a whole host of problems. It is my opinion that runner’s colitis and uterine prolapsed could be related to the higher impacts of heel strike running. Often, women are discouraged from running after having a child due to the possible onset of uterine prolapse. These are only my presumptions, but I would think the medical community would want to investigate all of these correlations further. 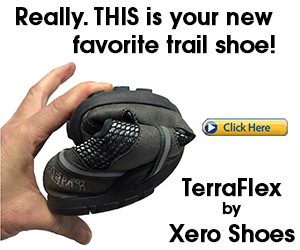 Now, let’s talk about the forefoot strike runner. The point of impact is isolated to the forefoot, with no sudden impact. The force diagrams¹ in figures b) and c) show a smooth increase and decrease in the forefoot, while the heel strike impact has a dramatic increase of force. As shown above, this force is not directed up the leg shaft, but levered through the forefoot bones. The force is translated to rotational motion around the ankle, and because the knee is also bent, there is rotational motion around the knee as well. So conversely to the heel strike, the major load bearing joints are allowed to bend and allow the tendons and muscles to take on the loading. First, the springy tendons on the bottom of the foot are allowed to take some impact due to the forefoot flexing. Then, the load causes translation of the forefoot up, which rotates on the ankle joint, and in turn, engages the springiness of the calf muscle –this is why the calves are so sore when transitioning to forefoot running – they are being used twice as much. Also, the knee is bent, and allowed to rotate, so the springiness of the upper thigh muscles is taking some of the shock as well. And finally the gluteus maximus, the largest muscle in the body is also engaged when the hip is allowed to bend, and thereby taking more impact loading. Basically, the entire leg is allowed to act as one big spring which decreases the impact to all of the joints, lower back and internal organs. As mentioned above, the problems that could be associated with high impact heel strike running, such as multiple foot ailments, degenerative joint arthritis, lower back pain, various organ maladies, and probably many others, may be alleviated by reducing the shock. 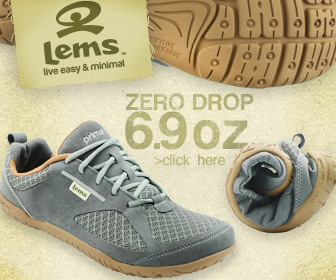 This is what shoe manufactures have been working on since the 70’s. 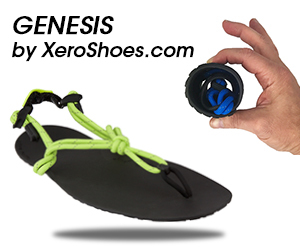 The problem is that no matter how springy a material that you could design in a 2 inch thick heel, it could never equal the 3 foot length of the leg and muscles allowed to absorb shock through the proper running technique of forefoot running. But, why does this running technique seem so new, and was man really meant to run in the first place? This question easily comes up in mind of the struggling heel strike runner, but running is 4 million years old. Click here to read my initial experience with forefoot running as well as some helpful tips to help you transition safely. shod runners, Vol 463| 28 January 2010. doi:10.1038. Nature, 08723. Is There a Safe Way to Heel Strike While Running?